EuroAutomobile is proud to present the Stelvio Quadrifoglio at the Alfa Romeo Motorshow 2019, held from 7 to 13 January 2019 at Suntec City, West Atrium. Presented by Pontus Haggstrom, APAC Head of Alfa Romeo, at the Alfa Romeo Motorshow 2019, the Alfa Romeo Stelvio Quadrifoglio is poised to deliver an exhilarating driving experience with its sporty, Italian styling. The Stelvio Quadrifoglio's list price is estimated at $398,000 with COE after homologation (estimated to go on sale from March 2019), and is set to become the benchmark for the premium SUV segment. The Stelvio expresses the authentic Alfa Romeo spirit, embodying the five ingredients that make Alfa Romeo one of the world's most desirable automotive brands - distinctive Italian styling, state-of-the-art engines, impeccable weight distribution, unique technical solutions, and an outstanding power-to-weight ratio. Developed in Alfa Romeo's prestigious engineering centre in Modena, the Stelvio is manufactured in the Cassino plant on a production line dedicated exclusively to Alfa Romeo's latest models - including the stunning Giulia, which launched the brand into a new era in 2015 with its revolutionary styling, sports handling and technology. The same ingredients are now tailored to the groundbreaking Stelvio Quadrifoglio, which offers pure-bred Alfa Romeo sports styling, superior performance, and technical solutions unmatched in the premium SUV segment. 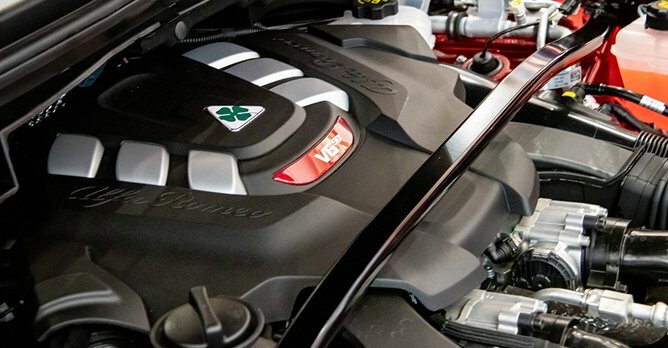 At the heart of the Stelvio Quadrifoglio is a unique power plant combining technology and performance - a 510bhp 2.9-litre V6 BiTurbo petrol engine with eight-speed automatic transmission. Drawing inspiration from Ferrari technologies and technical know-how, the six-cylinder BiTurbo petrol engine is made entirely of aluminium to reduce the weight of the vehicle, especially over the front axle. The Quadrifoglio version unveiled in Singapore features a body-coloured side-skirt with a carbon insert that further accentuates the car's sporting character. These features, combined with the front and rear bumpers and striking wheel-arches, make the Stelvio Quadrifoglio more like a sports saloon than a traditional SUV. The same sporting inspiration makes another appearance in the Quadrifoglio's clean and uncluttered interior, tailored like a bespoke suit - luxurious and stylish. Tyres shop in Bedok or Ubi?